Why liberals should not be disappointed with the current lackluster health care legislation. The news about health care is a little confusing these days. 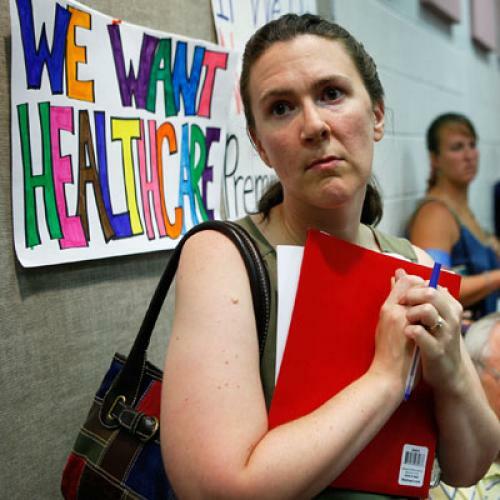 While polls show that Americans still support the key elements of health care reform that President Obama and his allies are trying to enact, there have been numerous reports of conservative activists showing up at congressional town halls across the country, protesting those same plans with an energy not matched by the other side. The imbalance may simply reflect the media's preoccupation with conflict and confrontation. Liberal rallies in favor of reform have garnered no similar attention, although they've attracted hundreds, and in some cases thousands, of people. But I suspect the enthusiasm gap is at least partly real--that the hate for the plans moving through Congress runs much stronger than the love, that the people fighting to stop these bills feel more intensely, and have more determination, than those fighting to pass them. If so, this ambivalence probably reflects a growing awareness of what the reform bills will do--or, more precisely, what they won't do. So far, the most ambitious measures are those that passed a pair of House committees in late July. They would, like all the reform plans under discussion, expand health insurance primarily by making it possible for most working-age people to get private insurance. But the changes designed to make that happen--in particular, the creation of a marketplace for buying coverage and the distribution of subsidies for people who need them--wouldn’t begin for four years. Even when fully implemented, many million people would still lack coverage. According to the Congressional Budget Office, at the end of the next decade, 97 percent of legal residents--and 94 percent of people here overall--would have insurance. Although that would be a lot more than the percentage of insured Americans now--today 84 percent have insurance--it's not truly universal. And the coverage would not be as comprehensive as what people in other countries have. There'd still be substantial co-payments and deductibles; people could still owe thousands of dollars in out-of-pocket expenses if they get really sick. As a fan of single-payer health insurance--a scheme that would, if properly designed, cover everybody with relatively small exposure to out-of-pocket costs--I certainly understand the ambivalence. It's tempting to think of what might have been, if only the bill writers had raised their ambitions and pushed a more pristine, more far-reaching measure. But there's a reason they didn't: Health care reform is politically difficult, particularly given the setup of American government. (The U.S. Senate, with its overrepresentation of small states and use of the filibuster, make it hard to pass anything.) It’s easy to forget, but the reform scheme Bill Clinton tried to pass in 1994 would have come pretty close to achieving most of the goals reformers now seek: It would have given generous insurance to just about everybody, by radically reorganizing the way medical care is doled out. That ambition was also a major factor in its demise. Maybe that means those of us on the left should dwell a bit more on what reform still would achieve--even if it's not everything we hoped. The bills that passed the House committees might not mean every single American would have insurance. But they would mean that every single American could get insurance if he or she wanted it. Insurance companies couldn’t deny coverage to somebody because of pre-existing medical conditions--nor could they cancel a policy retroactively, after a large claim, as insurers have been known to do. In fact, that change--an end to the practice of "rescission"--would happen right away. The insurance people get under reform would be relatively good insurance, too: The House bills, for example, would limit out-of-pocket expenses to $5,000 for an individual or $10,000 for a family. That's still more than people in other countries pay, yes, but it’s a far less than what many Americans end up paying today once they get a chronic or catastrophic illness. And keep in mind the exposure would be a lot less for lower-income people. Besides, it's not as if it will be impossible to scale up these reforms later on. If Congress passes and the president signs a bill putting in place the key institutional elements of reform now, they can always revisit, and strengthen, the measure later. During the 1980s, Henry Waxman almost single-handedly expanded Medicaid to its current levels by gradually making more people eligible and securing the funding to pay for them. All he needed was the institutional structure--the program, the rules, and the basic funding stream--on which to build the new coverage. The fact that Waxman is a chief architect for this year's program ought to give liberals confidence that, once again, these reforms needn’t represent the upper limit of what might be achieved over the next few years. They are a start, and a very good start, but not a finish. Of course, it's not a given that any of this will happen. We're still waiting to see what comes out of Senate Finance Committee, the last of five committees with jurisdiction over health reform. There, a bipartisan group of six senators are trying to hammer out a deal--and their progress has been slow. They seem likely to disgorge legislation that reaches even fewer people and offers even skimpier benefits. But the senators on the Finance committees, just like all members of Congress, respond to political pressure. The more pressure they feel to be ambitious, the more ambitious they will be. And that’s important, since Congress must eventually reconcile all the committee bills, taking into account whatever Finance produces. If the possibility of lesser reform doesn't motivate liberals, then maybe something else will: the possibility of no reform. Twice in the last few decades, once during the Nixon era and then again during the Clinton years, liberals largely shunned compromise efforts at universal coverage because they didn't live up to progressive ideals. But holding out didn't lead to better legislation. It led to twenty years of trying to rebuild the momentum for reform, followed by a debate over proposals that are, if anything, less sweeping than their predecessors. But forget all of the strategic second-guessing. There's a more basic and tangible reason why, even with compromises, progressives should engage fully in the reform battle. It's the fact that tens of millions of Americans go without health care, or endure financial hardship, because they can't pay for sky-high medical bills. If something like the House bill passes, life for these people would get immeasurably better--soon if not right away, for most if not all. They wouldn't have to give up their life savings, endure avoidable pain, or, in the worst of cases, watch a family member get sick and die because affordable medical care was not available. Surely that's a goal worth fighting for.